directly from Windows Explorer using context menu: select files, folders or .7z archives then right click and choose "Compress into a Self-Extracting .exe". That's all! Select the correct edition depending on your Windows version. Files digitally signed (with Microsoft Authenticode) to authenticate our company (G.D.G. Software SAS) as well as to ensure that the code has not been altered. Please verify the publisher to ensure you have downloaded genuine software. Once your download is complete, run the pbextsetupNN.exe installer file and follow the instructions displayed. Ensure that Windows Explorer is closed. This shell extension works with any recent version of Windows. It requires Paquet Builder 3 in order to compress and generate SFX archives. 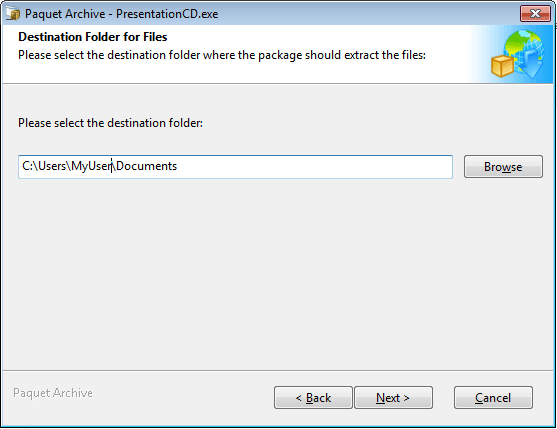 Paquet Builder shell extension lets you compress group of files, entire folders (with subfolders, keeping the directory structure) into Self-Extracting archives (SFX), and turn existing 7-Zip archives (.7z) into self-extracting EXE files. select one or more files, right click and choose "Compress into a Self-Extracting .exe". right click on a folder and choose "Compress into a Self-Extracting .exe". 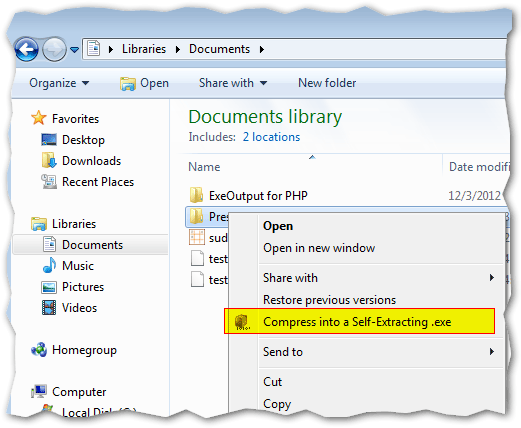 right click on a 7z file (7-Zip archive) and choose "Convert to a Self-Extracting .exe". You can modify pre-defined settings if you wish, like Window Title, Description and the path to the Self-Extracting EXE file that will be created. Click "Build" to continue. enable "Open Paquet Builder to customize the output settings" and Paquet Builder will be opened when you click on Create. Your Self-Extracting archive is not created until you compile it in Paquet Builder. 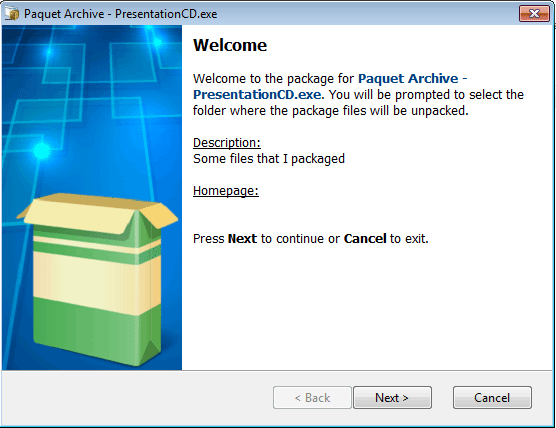 or you can enable "Create a Paquet Builder project file for later use when compiling". In this case, the Self-Extracting archive is created and a project file (.pbpx extension) is also output. 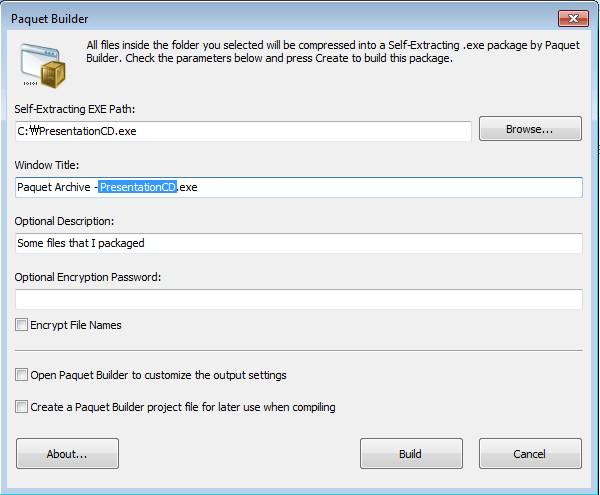 Then double-click on this .pbpx file to open Paquet Builder and modify the project. To uninstall Paquet Builder shell extension, select the Add/Remove Programs icon in the Windows Control Panel, then highlight Paquet Builder - Explorer Extension Add-On and click Remove.